Daniella Lucero helps make and sell CBD-infused bath products. Boutique operation brings CBD-infused bath products from West Jordan to the world. Outside the M Soaps by Marguerite shop in Gardner Village, on a brick pathway the shop shares with a boutique that sells "Utah's largest assortment of 18-inch dolls" and another that offers all things posh and pretty, sits a chalkboard sign that reads: soaps, bath bombs, CBD and more. Ostensibly, the lone acronym on the list is easy to miss, especially since it's paired with words that evoke thoughts of a Technicolor bubble bath—and more, whatever colorful, fragrant wonder that might imply. To any passerby who's clued-in on cannabis knowledge, however, the fact that M Soaps sells products infused with cannabidiol (CBD), a compound extracted from a particular strain of the cannabis plant, in the heart of suburban Salt Lake is enough to stir any Utahns' spirit. Marguerite Blakey has made soaps for 17 years. Only recently did she begin to sell soap products, as well as lotions, bath bombs and oils infused with CBD. The inception of M Soaps' CBD products happened at the intersection of her daughter Daniella Lucero's discovery of topical CBD treatment and the long-standing soap business. Following a motorcycle accident and subsequent surgeries, Lucero says doctors "basically handed [her] a lifetime prescription for Tramadol," an opioid used to treat moderate to severe pain. Firmly, Lucero declined the prescription and began using a CBD tincture that she applied to the affected areas in conjunction with physical therapy. It was at this point that she asked her mother to send her some of her lotions, which Lucero then began mixing with CBD. Now, for the past 19 months, the mother-daughter team has sold CBD products, like those Lucero concocted on her own, at the West Jordan shop. Situated in a nearly 150-year-old cabin, parts of which were transported to Gardner Village from Utah's Rush Valley, M Soaps is surrounded by myriad shops that epitomize the state's family-friendly (and at times lavish-to-a-fault) boutique culture. The shop capitalizes on that very same culture, offering all that's en vogue in artisanal bath and body care, with a twist. 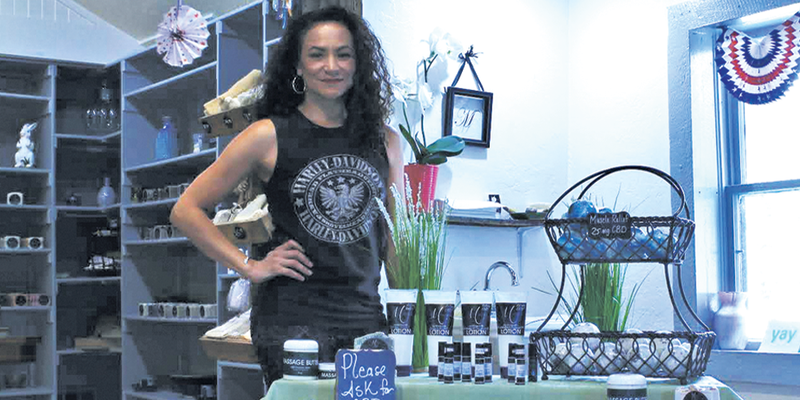 The way the retailer fits into the aesthetic and modus operandi of Gardner Village, Lucero says, makes her CBD products more palatable, particularly for patrons who might not try or even come near CBD products otherwise. "A lot of people chuckle and laugh when they find out where we are at," Lucero says. She notes, however, that those who frequent or wander into M Soaps aren't shocked or uneasy by the sight of something like a 4-foot tall bong or any other paraphernalia that might worry the average Utahn. "We are actually filling a void for a demographic that has heard about [CBD] and is interested in it, but that can't find it at Smiths, or can't find it at Whole Foods," she says. Although the shop's CBD products do not play directly into the current debate over medical marijuana in Utah (CBD, for the most part, is legal in most states and has the chance of becoming ubiquitously legal, should Sen. Mitch McConnell's Hemp Farming Bill of 2018 succeed), they have a role by familial association, so to speak. 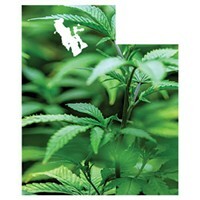 As Lucero says, "[CBD] just looks like its cooler cousin; it's not its cooler cousin." 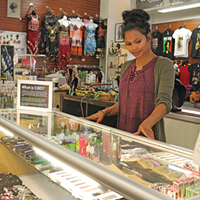 Perhaps it's M Soaps' palatability, both in the way it exists as a family-friendly shop and in the way it sells products that makes it a player in the push to legalize and normalize cannabis products in Utah. Although it currently serves a narrow demographic of shoppers who want to ease pain or anxiety, or those who simply want a fragrant bath bomb with the topical benefits of CBD, M Soaps' clientelle is growing. And so, too, the support for cannabis in Utah, with each pump of their CBD-infused Lavender and turquoise lotion or slather of pain-relieving massage butter. 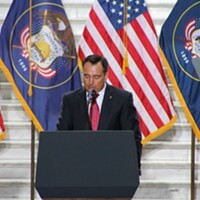 "It's happening," Lucero says, especially as larger companies continue to come to Utah, bringing with them a workforce with needs different than those of homegrown workers. In particular, Lucero points to Lehi and its Porsche dealership, a place she and her friends used to ride dirt bikes. To her, it's evidence that the culture and demographic of the Salt Lake Valley, its bordering cities and beyond, are morphing toward the progressive. "The landscape is changing," she muses. 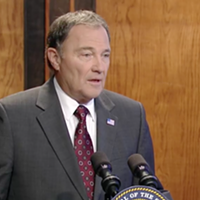 "With that fresh blood that's coming into the valley, things are going to change whether [Utahns] like it or not—these people vote, too."